We’re never too old to become a best-selling author. But there will be many bumps along the way. There will good days and there will be bad days. But our skill improves with the 3 imperatives of writing: read to learn from other authors, develop your process, and write. And write. And write. Writing about people requires a study of human nature, an understanding of what your character would do next if s/he were real instead of fiction. There are seasons in the process. Spring bursting with hope. Summer filled with inspired writing. A fall in leaves and temperatures and confidence and the deep chill of winter. And then the spring of hope again and a summer of fruition. The secret to success: Persevere. Keep your ears tuned for what resonates, keep looking for inspiration, and give your project room to surprise and challenge you. A Group Discussion of My E-book! Writing a book can be a long and lonely process, so hearing a reading group discuss my published product with insight was validating. The activity was productive in a very positive way. I gathered ideas on how to make my second book more powerful. And I walked away with a clutch of comments like hugs to draw on during down times. October is National Reading Group Month. How fitting that the first (note the optimism) formal discussion of my book took place in October, October 31st—Halloween—as it were. It all seemed particularly auspicious for a discussion of “Beware the Sleeping Dog”. I anticipated the discussion with considerable nervousness. I’m so much better at writing than at speaking. Imagine a group of esteemed academics discussing my book! One gentleman was the professor for a psychology course which I took years earlier. Little did I know at the time that I would now be discussing my published novel with him and other professors of humanities, engineering, mathematics. My neighbor Dorothy accompanied me as a special guest. She played a dual role as my friend and neighbor and as the friend and neighbor of my primary protagonist. Afterwards she told me she observed approval and warmth on the faces of the participating group. Aaah, validation! Some writers (including me or perhaps especially me) are a needy group seeking approval wherever approval is to be found: through ratings and comments on http://www.amazon.com; through spoken words of praise from family and friends; and through treasured moments in a book discussion. I’ve included a motley mixture of comments, most of them closing with great job (or maybe it was “good” job) and some supportive words for my-novel-in-progress. Remember the power is in the pen and so this is all from my perspective. “I think I found Mavis annoying and rash in the same way that Alice did! For such a bright person, she clearly shot from the hip at times.” (I interpreted that as a resounding success for my Alice character.) Another gentleman said he thought Mavis was brave in facing her demons. No one apparently had any reservations about the little hound. The unique strengths of a book depend on the reader’s expectations. One professor gently indicated my character seemed a little stiff with her internal dialogue, especially about religion. Another indicated that my character’s internal dialogue rang true. Both were right, of course, as it’s all about perspective. There was some speculation as to whether or not I had written myself into the book. In my opinion, fiction writers almost always share an integral part of themselves with the characters they create. Or maybe it’s the other way around: characters share a part of themselves with their authors. In order to show not tell, I had to experience situations through my characters senses. So really fiction writers are actors playing many roles. Of course, Dorothy is a real person. Sprite and Velcro were my beloved pets. Carl and Gladys were my parents in real life. Will there be a murder as well as mayhem in my next mystery? Will Ron and Mavis move ahead with their relationship? Will Mavis still shoot from the hip? Time will tell on that. I have a beginning and an ending and 17,000 words written for the second mystery. A lot can happen in the next 53,000 words and through the subsequent flurry of edits and rewrites. 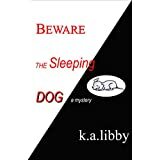 One of the many benefits of this book discussion is the expressed possibility of “Beware the Sleeping Dog” becoming the book club offering of two reading groups. I’m thrilled and honored at that prospect. Do I walk a little taller and smile a little more after Friday? Yes! Thank you to a group of kind and attentive academics. And to my fellow writers: Keep writing prolifically and embrace every opportunity to discuss your endeavors. I would be honored if you would comment below in the “Leave a Reply” block!